This week’s sketch is being sponsored by Doodle Pantry. I have several of their digital images, sentiments and papers. My favorite is the Cuddly Bear (see post of June 19th — Cards 4 Kids). What I like most about Doodle Pantry’s images is that many of them come colored. I like printing out the digital images in color and adding them to cards. I also like the diversity of the images coming in both black and white or color – love OPTIONS!!! 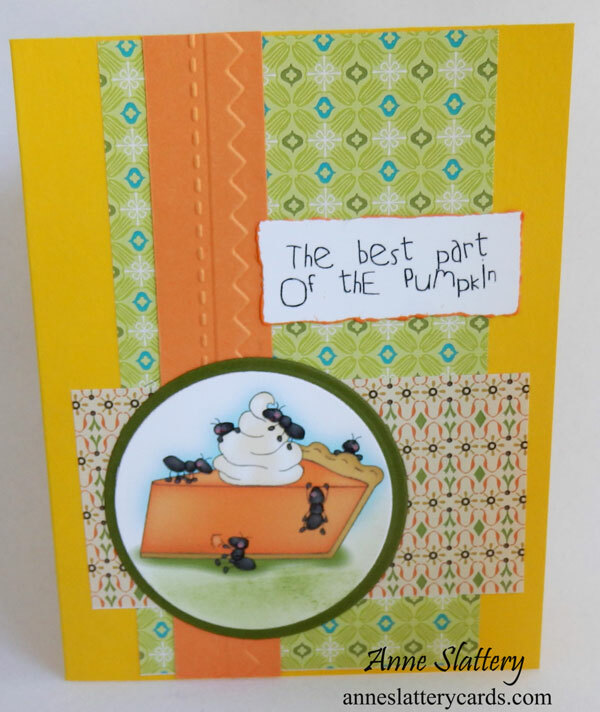 In keeping with my fall card making for OWH, I printed out this Pumpkin Pie Ants colored image on the computer, cut it out using a Spellbinders circle die, matted it on another circle (in green). 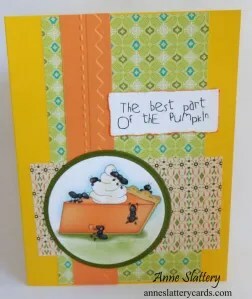 The papers are also from Doodle Pantry (Pumpkin Pie Paper R1 and R2). I used a Cuttlebug folder for the middle strip, and sponged some Memento Bamboo leaves on the bottom of the pie to color in the white space. I printed the sentiment on the computer (also Doodle Pantry) and cut it out using the Distress Edged Card Creator die and sponged with Memento Tangelo ink. Such a cute card, it has a 1940’s feel, fun homey, comfortable feel. Love it! TFS!